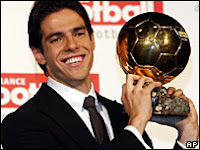 AC Milan playmaker Kaka has been awarded France Football's 2007 European Player of the Year award, beating off strong challenges from Cristiano Ronaldo and Lionel Messi, who finished second and third respectively. Kaka has already scooped up the FIFPro World Player of the Year award, as voted for by his fellow professionals and is the favourite to take FIFA's World of Player of the Year award later this month. "It's the top prize around and the only way to win something like this is to play for a team like AC Milan. "It's great to be part of a team that wins. "I won the Champions League and was the competition's top scorer. That's what made the difference with the others. "That is the key. You have to play in a winning team."